In an isolated village, a bride is visited on her wedding day by her former lover. This act of rebellion sparks a sequence of events that will shock everyone, from the flower girls to the vengeful Moon above. In a translation by famed American poet Langston Hughes, Federico García Lorca’s iconic Andalusian tale explodes notions of violence, desire, shared history and community – reminding us that the only undeniable truths are love, death, and change. Incorporating live music, dance, and art installation from a host of creative collaborators, The Williams Project’s Blood Wedding is not just a piece of theatre. It's a play, a block party, a communal meal, a concert, a gathering space for friends and strangers. In other words, everyone is invited to the wedding! This one-weekend-only event is a Williams Project developmental production, rehearsed in just two weeks and shared with a spirit of experimentation and surprise. Picture a jam session by your favorite band, or a comedian testing brand-new material. Something unique in bound to happen every night, and we can't wait to embrace the unpredictability of live theatre with you. 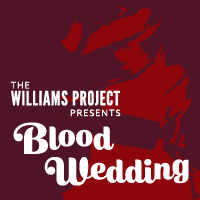 The Williams Project is thrilled to partner with Equinox Studios to present Blood Wedding. Equinox is a Georgetown studio complex and community hub that’s home to more than 125 artisans working in blacksmithing, metal sculpture, painting, ceramics, woodwork, leatherwork, glass, and photography.